The American Academy of Ophthalmology (AAO) 2015 Annual Meeting was held November 13-17 in Las Vegas, Nev. Retina Subspecialty Day included a number of important presentations featuring data that may shape the future of retina practice. As a service to our readers, we gathered information on a few of those talks. This list is not meant to be exhaustive; rather, it is meant to serve as a quick refresher and a jumping-off point for further reading. Investigators in the Diabetic Retinopathy Clinical Research Network (DRCR.net) Protocol S trial randomly assigned 394 eyes with PDR to treatment with PRP or ranibizumab 0.5 mg. PRP was completed in one to three visits, and ranibizumab injection occurred at baseline and as frequently as every 4 weeks. 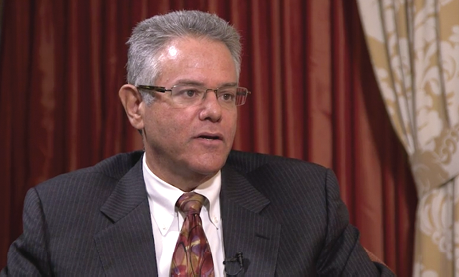 Jeffrey Gross, MD, sits down with Eyetube Daily Coverage to discuss his AAO presentation on Protocol S.
Eyes in the ranibizumab group showed a mean 2.8-letter improvement from baseline at 2 years; eyes in the PRP group showed a mean 0.2-letter improvement (P < .001 for noninferiority). PRP treatment was associated with a significantly greater mean peripheral visual field sensitivity loss, a significantly higher rate of vitrectomy, and significantly more frequent development of diabetic macular edema (DME) at 2 years. 1. Gross JG. DRCRnet Protocol S. Paper presented at: American Academy of Ophthalmology 2015 Annual Meeting, Retina Subspecialty Day; November 13-14, 2015; Las Vegas, NV. 2. Writing Committee for the Diabetic Retinopathy Clinical Research Network. Panretinal photocoagulation vs intravitreous ranibizumab for proliferative diabetic retinopathy: a randomized clinical trial. JAMA. 2015;314(20):2137-2146. Patients in the FAME trial, a pair of 3-year phase 3 clinical trials, received continuous low-dose fluocinolone acetonide therapy (0.2 mg) for treatment of DME or sham treatment. At month 36, 17% of patients in the treatment arm progressed to PDR, compared with 31% in the sham arm (P < .001). 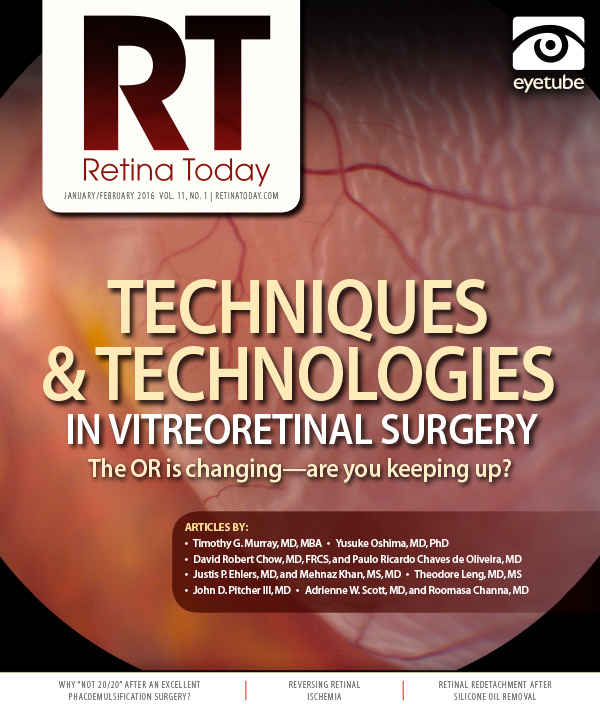 Researchers determined progression to PDR based on fundus photographs that were graded by a masked, certified reading center and by the incidence of the use of PRP or vitrectomy to treat PDR. 1. Wykoff CC. Analysis of diabetic retinopathy progression in patients treated with 0.2 micrograms/day fluocinolone acetonide over 36 months. Paper presented at: American Academy of Ophthalmology 2015 Annual Meeting, Retina Subspecialty Day; November 13-14, 2015; Las Vegas, NV. Dr. Dugel reviewed data from the DRCR.net Protocol I study, assessing 854 eyes with DME that received anti-VEGF injections. Patients were placed in three cohorts based on the number of letters gained on the ETDRS visual acuity chart at week 12. The cohorts were defined as those who gained less than 5 letters, gained between 5 and 9 letters, and gained at least 10 letters. Researchers compared patients’ 12-week statistics with their statistics at 3 years. At week 12, the unadjusted differences in mean BCVA change from baseline in the three groups were -0.3, 6.9, and 15.2 letters, respectively. At year 3, the unadjusted differences in mean BCVA change in those groups were 3.0, 8.2, and 13.8, respectively. After multivariate adjustment, significant correlation remained between BCVA gain at week 12 and at years 1 and 3 (P < .001). 1. Dugel PU. Long-term response to anti-VEGF therapy for diabetic macular edema can be predicted after 3 injections: an analysis of Protocol I data. Paper presented at: American Academy of Ophthalmology 2015 Annual Meeting, Retina Subspecialty Day; November 13-14, 2015; Las Vegas, NV. Patients in a multicenter phase 3 trial were randomly assigned to intervention or control group. Those in the intervention group received gene therapy with SPK-RPE65 (Spark Therapeutics) in both eyes. More than one-third of patients (seven of 20) in the treatment group experienced a 15-letter gain at 1 year in the first treated eye, compared with no patients in the control group. One-fifth of patients (four of 20) in the treatment group experienced a 15-letter improvement at 1 year in the second treated eye, compared with none in the control group. According to the visual acuity data presented at the AAO meeting, the phase 3 trial met its primary endpoint (bilateral mobility testing from baseline to 1 year) and three secondary endpoints (visual acuity improvement, full-field light sensitivity threshold testing, and mobility testing for the first treated eye, all measured at 1 year). 1. Maguire AM. Phase 3 trial of AAV2-hRPE65v2 (SPK-RPE65) to treat RPE65 mutation-associated inherited retinal dystrophies. Paper presented at: American Academy of Ophthalmology 2015 Annual Meeting, Retina Subspecialty Day; November 13-14, 2015; Las Vegas, NV. 1. Boyer DS. Squalamine eye drops in retinal vascular diseases. Paper presented at: American Academy of Ophthalmology 2015 Annual Meeting, Retina Subspecialty Day; November 13-14, 2015; Las Vegas, NV.